1. Ryan and I have been together since our sophomore year in high school. When we are 30 we will have spent half our lives together! 2. I love outdoor sports like snow boarding, wake boarding, and dirt bike riding. One winter we went snow boarding at least 14 times! I'm not a team player, it's never sparked an interest in me. 3. Ryan recently acquired a street bike (motorcycle) and I have to admit one of my favorite things is to go for a ride on it! There are a lot of fun canyon roads around where we live. Plus he looks totally hot on it :) This is his bike, a Yamaha FZ6 4. I am obsessed with all things Twilight, well, just the books anyways. 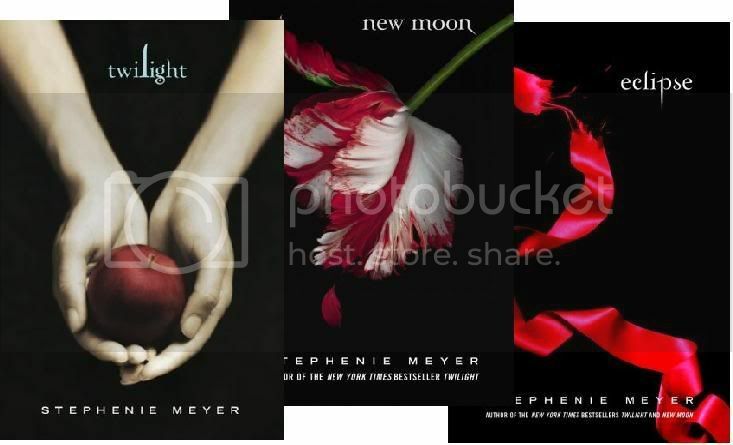 I read Twilight 2 1/2 years ago and quickly snatched up New Moon and Eclipse and of course I'll be getting Breaking Dawn as soon as it comes out. Even though they're teen fiction, they are the best books I've read in a long time. 5. Sushi is one of our absolute favorites! Ryan could eat it every night for dinner but we would be in big trouble if he did! We try to go once or twice a month. There are literally about 10 sushi restaurants in a 5 mile radius around us, so its fun to try new places all the time. Not only is it delectable but its such a lovely art form as well! I love it when little kids eat sushi. When we have kids they are going to be sushi addicts! 6. We love going to concerts. The first concert I went to was Green Day when I was in 8th grade, and my parents took me! Since then I've probably been to at least 10-12. We've already been to one this year (Jimmy Eat World and Paramore) and will probably go to 2 or 3 more; Good Charlotte, Paramore again and Warped Tour (hopefully). Oh, and I'm going to see New Kids on the Block with Kim in October, so that will be 5 for me this year! 7. We have 2 cats, Misha and Zoey. Misha is 3 and a fat, lazy cat. Zoey is 1 1/2 and a little spitfire. They keep me entertained quite frequently. 8. I would love to get rid of everything we have and just travel the world. 9. There is a huge list of movies that everyone has seen from the 80's and early 90's and I haven't seen any of them. Ryan makes fun of me for it all the time. I guess as a kid since I was the oldest I didn't pay attention to what my parents were doing because I probably thought it was boring. Up until a week ago I hadn't even seen any of the Indiana Jones movies. 10. I don't really have a food vice. Some people have their all time favorite junk food item or the one thing they can't live without in the fridge, but I don't have that. I don't eat a lot of sugar, and when I do, I think it's way too sweet. However, if cheesecake was somehow miraculously fat and calorie free and still as delicious, I'd be all over it all the time! Our 5 year anniversary is only a month away!!! I'm really excited so I just had to share that :) Why is it that anniversaries that are in the multiple of 5 or 10 are the most important ones? Like , wow, its our 20 year anniversary! How come you don't celebrate year 33 or 17 as one of the "big ones". Just a random thought. I've been dropping ridiculous amounts of hints to Ryan to take me to The Melting Pot (fondue, yummy!) so hopefully he follows through! I tried to put these in order but they came out backwards from what I wanted when I uploaded them. So you can either scroll down and get pictures from now to previous times, or start at the bottom if you want to do it chronologically! Yes, we got the biggest van U-Haul has to offer. Sad, huh? Dirtbike riding while we camped. The massive amounts of snow that Rexburg received this last winter. I got this survey in an email but I thought I'd add it to our blog. I'm going to do it for myself and attempt to fill it our for Ryan too. If I get anything wrong he can change it but he probably won't even notice! 1. What is your occupation right now? 2. What color are your socks right now? Not wearing any-I'm in Cali so it's flip flops for me! 3. What are you listening to right now? 4. What was the last thing that you ate? 5. Can you drive a stick shift? 6. Last person you spoke to on the phone? 7. Do you like the person who sent this to you? 8. How old are you today? 9. What is your favorite sport to watch? 10. What is your favorite drink? 11. Have you ever dyed your hair? 13. What is the last movie you watched? 14. Favorite day of the year? 15. How do you vent anger? 16. What was your favorite toy as a child? 20. When was the last time you cried? 21. What is on the floor of your closet? 22. What did you do last night? 23. What are you most afraid of? I'm really not sure . . .
25. Favorite day of the week? The first Indiana Jones, Raiders of the Lost Ark. 26. How many states have you lived in? Sorry if that was totally boring-we are so uninteresting! I'm still unpacking and organizing, it's going to take a long time. I took the CBEST last Saturday, a necessary step in obtaining my California teaching credential. I should have the results in about a month. It's getting so HOT here! I'm really happy that we have a few pools that we can access at our complex. Life is pretty good here and I'm quickly getting used to California life again. We've haven't done anything fun yet, we've just been unpacking, going to the pool and playing Rock Band (I'm an aspiring drummer:) lol!) I love that we are in such a good location with so many amenities around us. The city is about 40 min. away and the beach is about an hour away. It doesn't really feel like SoCal here at all, there are no palm trees, honest! It kind of reminds me of a combination of Las Vegas (minus the adult playland stuff) and Fremont, if you can picture that! Am I a traitor to my NorCal upbringing because I'm starting to enjoy SoCal? I can't help but try to like the new place I live, otherwise I'll go crazy. I'm saying this because I layed out by the pool and went for a swim today. I just have to stay it feels soooooooooooo good to be in the hot sun after the long, freezing, depressing winter I spent in Rexburg. Ryan has no idea because he left before the huge amounts of snow came pouring down. Yeah, I think I might be able to get used to life here . . . just have to remember to always wear sunblock (and I did!). -Even though it's California where Wal-Marts are usually harder to come by, there is not just a Wal-Mart but a supercenter only 0.8 miles away! I'm so happy about that because I can save tons of money, and even driving there won't break the bank. In Idaho I had to drive 1/2 hour to get to the closest Wal-Mart supercenter, but here its just around the corner! -I've seen the ghetto bird, have you? It's a rare sight here in the valley, but downtown you can usually see it almost every night. Get groceries in hand, lock the car, walk up the path, walk upstairs, unlock the door, put groceries in, lock the door, walk down stairs and down pathway to car, repeat 2-3 times. -My cats love it here. They sit at the sliding door and watch the birds and squirrels go by. They've never seen huge trees or heard birds like this, so they're really intrigued. It's fun to watch their reactions. -Everyone's car is sparkling clean except for mine, even if they haven't washed theirs in a month. The streets are extremely clean here compared to Idaho. -I have to pay CRV again. -I'll probably cry when we go to register our cars. I think mine cost all of $52/year in Idaho. -A LOT of people are in "the industry". For example, our friends live in Van Nuys and guess who they go to church with, Brooke White from American Idol. So weird. And in our church here we met a guy who's in a band that just signed with a label and they're recording an album this fall. Weird! Another guy we met at church is a computer animator for Dreamworks. And that's just a very small sampling of how many people are in "the industry". Unpacking is completely overwhelming. It took me a few days just to get this place clean so that I can feel comfortable putting my own things everywhere. I'm working on the kitchen today and it feels like there is no end in sight. The weather is so beautiful and I just want to go sit by the pool! I have to get this done though, otherwise I will be very flustered and irritated, even more so than I am now. Ryan's lucky because he just gets to leave it and go to work everyday, and when he gets home more work is done. Better get back, I'm almost done and then I have to break down all the boxes so we have some room to walk! Oh, by the way, I was totally elated to go to Trader Joes yesterday though. Unfortunaley, I haven't been able to enjoy much of what I bought because as of yesterday everything for the kitchen was still boxed up! It's getting better now and I think I'll even have time to go to the pool tomorrow! Our move to California is over but the moving in has just begun. It took us about a week to get everything packed up in our house, clean it, have a garage sale, etc. We got our U-Haul almost 2 days later then we were supposed to so that set us back but at least it came to us. They first told us we were going to have to get it in Wyoming (yeah right!) but thankfully we didn't have to. We got in around 6:00p.m. on Friday night and unloaded everything with some help which was greatly appreciated. I don't know how we did it but the moving van was empty about 3 1/2 hours later. There have been a lot of glitches and it's going to take a while to figure everything out. Ryan's utility trailer doesn't fit in the garage, it's about 9 feet tall and the garage door is only 7. Then he had his trailer unhitched parked on the street and got a parking ticket. I guess they're breaking us in to California. Our condo is nice but was not clean, really deep cleaned, at all. I've been spending all weekend trying to clean around the mess that is our boxes and furniture because nothing is where its supposed to be. Ryan has been putting the furniture where it needs to go as best as it can be done right now, and doing the technical stuff like getting our internet and dish set up. It's going to take a few weeks to clean and get everything where it needs to be, but once that's all in order it should be good. I'm getting used to the fact that I once again live in California, and now I live in a condo with a detached garage where I have to park on the street and walk a few minutes to get back home, but hopefully it'll feel like home soon. At least I have time to get organized, and then the job hunt will begin. I'll post some pics once it looks more like home, not a place full of boxes and unorganized stuff!